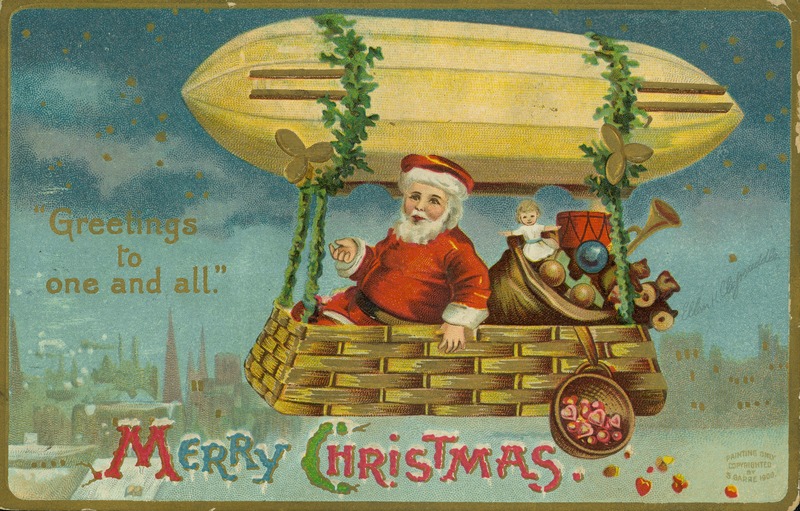 It was Christmas Eve, 1897, and Joey Lunardi had invited us all up for a party on his airship, but he was anxious, because he wanted the party to end so he could make it in time for midnight mass. The plan was to land in Central Park’s airstrip at 11 o’clock and we’d all get in electric taxis to the church. Best laid plans of mice and airmen, often go a-gley – in this case, the turning point was when the flamingos went missing at 10:35. Claire LeMaire, star of stage, screen and Edison cylinders, had just won the diamond prize for guessing the most mystery dishes at the buffet. And Joey, he didn’t do anything small – it was a flawless 10-carat rock, hanging from a pretty hefty gold chain. Claire was waving the thing under the nose of her “patron”, Eddie the Rat, taunting him. “How come you never get me anything this nice, Eddie?” she said, while casting a flirtatious glance at Joey. And so, after ten minutes of recriminations flung at Claire, Joey and Eddie’s “associate” Dasher Adams who was supposed to be Eddie’s bodyguard for the evening (“But nobody said nothing about being no birdguard, boss.”), Ava Astor suggested searching the airship. “Maybe it’s a prank,” Eddie said sinisterly. “But it ain’t a very funny one, because dose flamingos, dey don’t belong here. So youse got to be neighborly and not upset them. Flamingos are very delicate birds.” Claire, who was already in tears from the previous shouting match, now melted into a useless puddle on the snow white divan. The rest of us began the search for the missing birds. One of the chorus girls stayed with Claire, while the rest of us naturally fell into pairs. There were a surprising number of nooks and crannies on this airship – the kitchen galley, the ladies’ restroom, the gentlemen’s facilities, the closets, and of course, the crew quarters, the telegraph room and the control car. I wound up with Ava in the control car. The pilot on duty courteously suggested that there were no flamingos in the control car, and that we would be more comfortable on the main deck. We retired quietly to the telegraph room. By that time, it was 10:50, and Joey was yelling so loud, they could probably hear him in passing airships. I started to light a cheroot when Ava took the lighter from me. “What are you trying to do? Blow up the airship?” “Sorry,” I muttered, and shot the cuffs of my evening suit. “Joey, you ain’t stoppin’ anyone.” It was Eddie’s bodyguard, Dasher Adams, looking like a scared rabbit. A scared rabbit with a blow-torch. Joey kissed Claire, and I looked at Ava Astor and wished she was still Ava Willing. She looked like she felt the same, but what was done was done in 1891, and all our wishes were horses. Still, we had the satisfaction of a job well done, and that would have to be enough. We looked out the window of the airship, and watched the stars and moon float in the night sky. This entry was posted in Christmas stories and tagged Ava Astor, Ava Willing, Christmas story, E.M. Duskova, Michaeline Duskova, short story, steampunk Christmas. Bookmark the permalink. (-: Thanks, Penny! I was really afraid there wasn’t going to be a Christmas story today, but then it showed up. (-: Thank you! I really like this era . . . if I can twist it a little bit. So fun, Michaeline! I love how the flamingoes are major characters. Although right now I have some sympathy for the idea of hijacking an airship to go to Florida. Oh man, yeah for Florida! We’ve had a lot of snow over the last couple of weeks, so it’s been an early white Christmas. But today, now that it’s really Christmas? Rain. And lots of it. On top of slush. It’s OK for now, but if it freezes overnight . . . the drive to work is going to make me wish for an Airship to avoid the roads! You have the perfect voice for steam punk! Aw, thanks! That means a lot. I really do like the concept.